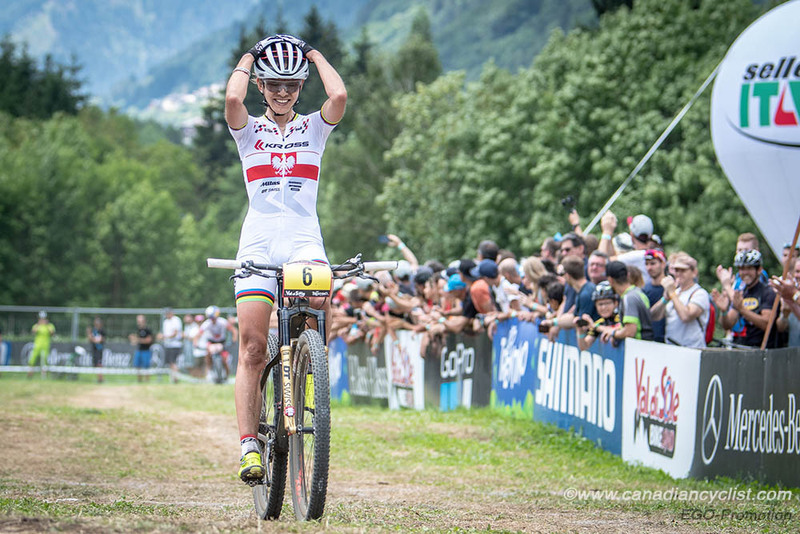 Round 4 of the UCI Mountain Bike XCO World Cup in Val di Sole, Italy, featured some of the most exciting race of the season, with Maja Wloszczowska (Kross Racing) winning her first World Cup since 2012, the fourth of her career, in the women's race, while Nino Schurter (Scott-SRAM) took his third consecutive win, extending his lead in the men's overall standings. When a start loop crash took women's World Cup leader Annika Langvad (Specialized) out of the race, Jolanda Neff (Kross Racing) moved into the leader's jersey, after finishing third in Val di Sole. 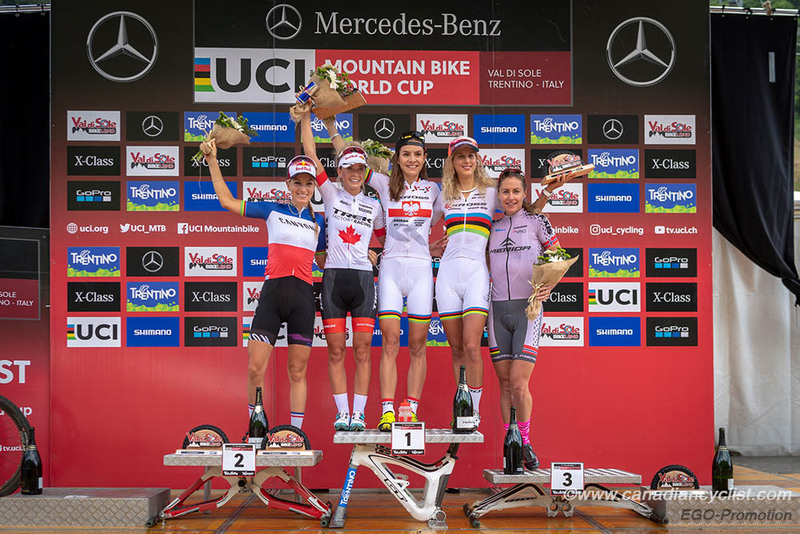 Emily Batty had one of the strongest races of her career to finish only nine seconds behind Wloszczowska, with two more Canadians in the top-20; Sandra Walter (Canadian National) in 18th and Haley Smith (Norco Factory) in 19th. The four kilometre Val di Sole circuit features some of the steepest climbs on the World Cup; two each lap followed by technical descents where good descenders can catch back on. A crash in the first 200 metres at the front of the women's race took Langvad out of the race with a wrist injury, as well as Linda Indergand (Focus XC), who broke her bike frame. Fourth ranked Anne Tauber (CST Sannd American Eagle) and Annie Last (KMC-Ekoi-SR Suntour) were both also delayed with the crash, although Tauber had a strong ride back up from the mid-30s to finish tenth. On the first lap a group of five formed, which stayed together for all but the final lap and a half of the six lap race. Neff shared the early pace setting with Pauline Ferrand Prevot (Canyon Factory). Canadian champion Emily Batty (Trek Factory) followed them without much problem, while Wloszczowska and Gunn-Rita Dahle Flesjaa (Team Merida Gunn-Rita) would get gapped on the climbs but rejoin the front of the race before the end of each lap. Halfway through the penultimate fifth lap, Wloszczowska attacked hard on the second climb, opening a gap as Neff wouldn't chase her team mate and the others hesitated. Batty finally took up the chase, marked by Neff as Ferrand Prevot and Dahle Flesjaa dropped back for good. Neff gapped Batty slightly before crashing, and was then dropped on the final lap by Batty, who was chasing Wloszczowska hard, but could not close the gap, finishing nine seconds back, followed by Neff at 30 seconds, then Ferrand Prevot and Dahle Flesjaa. In addition to Walter and Smith, other Canadian results include Maghalie Rochette (Clif Pro Team) in 41st, Catherine Fleury (Canadian National) 46th, Cindy Montambault (Canadian National) 52nd, Elise Nieuwold (Pendrel Racing) 52nd, and Rebecca Beaumont 56th. "Winning here means that I am still young and powerful!," said Wloszczowska. "I've been so many times second and third, and last year I was second overall, but there was always something missing. Today I had an okay start, but not in the leading group. I managed to chase up, but Jolanda, Pauline and Emily looked like they were stronger than me, but as the race went on I was feeling better and better, and I knew that I needed to make a move, and wait to the end. So I tried with two laps to go and it worked." Batty was both pleased and disappointed with her second place; the third time in her World Cup career that she has finished second. "I'm not sure yet whether to be happy or really disappointed. After struggling in the early season, it's pretty exciting to have a good result, but it's so damn close to that win! But we get another shot in six days [Vallnord, Andorra]. Pauline and Jolanda did a lot of work at the start and I wasn't sure where I was at, what I was capable of, so I just tried to play it smart. There was a bit of team tactics when the gap formed and I just wasn't able to get around [Jolanda]. I was turning myself inside out to bring Maja back and get that win, but I came up a few seconds short." "I'm happy with how I rode today," said Sandra Walter. "You can't hide on this course and if you don't have good legs, it's going to be a long day. Luckily I had good legs! I was able to move up steadily for most of the race and secure my second top-20 of the season and my second-best Euro World Cup result (after Albstadt). It was really cool to see Emily [Batty] ride onto the podium and it was motivating to ride with Haley [Smith] for part of the race. It was also great to see so many Canadians making the trip out here to test themselves amongst the best in the world. My job would be way harder without the awesome and extremely professional support of the Cycling Canada coaches and staff. This has been a positive project so far, and I'm really enjoying spending time with the team. I'm looking forward to another go at it in Andorra next weekend!" Haley Smith, who is having a breakout year, said "I was a bit apprehensive about today's race, as I'm not feeling quite recovered from my last training block yet. The first half of the race was rough - just couldn't get my legs going - but it got better as it went along. As coach says, 'we train hard so that our off-days can still yield solid results', and that was the game today! Really stoked on Emily and Sandra's rides; it's super motivating to have such a strong showing for Canada over here!" National coach Dan Proulx commented, "Emily's ride was exceptional. She was in it to win it today, and that focus really paid off. She was strong and, as always, tactically savvy. She's having a good season and will likely improve more as we head toward Worlds. It was great to have three riders in the top 20 in the women's race. Emily, Sandra and Haley did a great job. That will earn us a significant number of Olympic Qualification points." Langvad drops to second in the standings after not finishing, 52 points behind new leader Neff who has 975 points. Ferrand Prevot remains in third at 806 points, with Wloszczowska moving up to fourth from sixth with her win. Batty moves up to seventh from tenth in the standings - only 90 points out of the top five. Smith moves up one spot to 21st, while Walter jumps to 24th from 33rd. Catharine Pendrel (Clif Pro Team) - absent due to a broken arm - drops to 20th in the standings. Other Canadians: Cindy Montambault 43rd, Rebecca Beaumont 68th, Maghalie Rochette 73rd, Catherine Fleury 79th, and Elise Nieuwold 89th. The men's race saw Henrique Avancini (Cannondale Factory) lead through the start loop before the first of seven laps, but after that it was all Schurter, as he attacked on the first climb. Mathieu van der Poel (Corendon-Circus), second in the overall standings, was the only one to stay with Schurter on the initial attack, although Luca Braidot (Centro Sportivo Carabinieri - Cicli Olympia) did join them for a short time at the end of the lap. Schurter then dropped both van der Poel and Braidot on a descent on the second lap and powered away to a 30 second lead over the chase group that formed behind, containing van der Poel, Braidot, Florian Vogel (Focus XC), Italian champion Gerhard Kerschbaumer (Torpado Gabogas), Avancini, Mathias Flueckiger (Thomus - RN Racing) and Stephane Tempier (Bianchi Countervail). Over the next two laps the chase dropped down to just Kerschbaumer and van der Poel, with the Italian rider doing much of the work and finally dropping van der Poel late in the fourth lap. By Lap 6, Kerschbaumer had caught Schurter - but was the world champion fading or easing up? 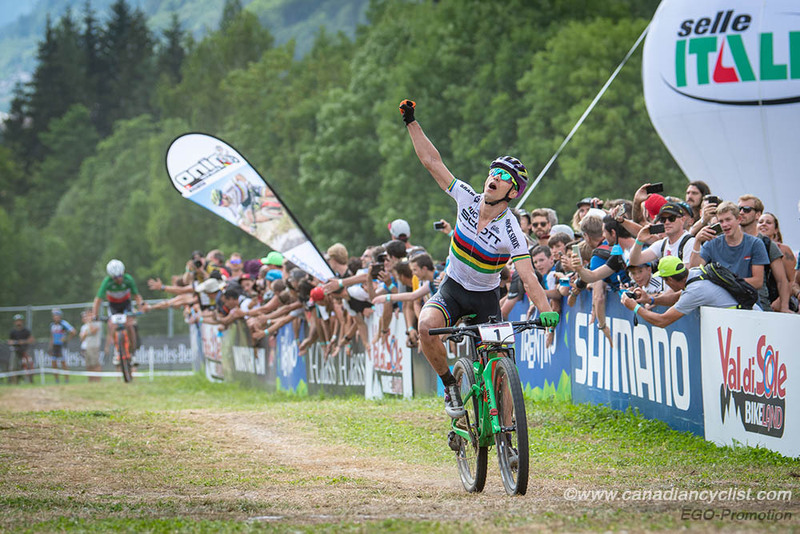 The pair rode together for the last lap and a half, with Kerschbaumer trying one attack on a climb that Schurter easily foiled, before countering as they entered the final descent to pull away for the win. van der Poel hung on for third, just ahead of Avancini, who became the first Brazilian rider to make it onto a World Cup podium. "I was mainly worried about Mathieu [van der Poel], but it was Gerhard [Kerschbaumer] who joined me," said Schurter. "I was able to recover a little bit on the last lap and then do one last attack. 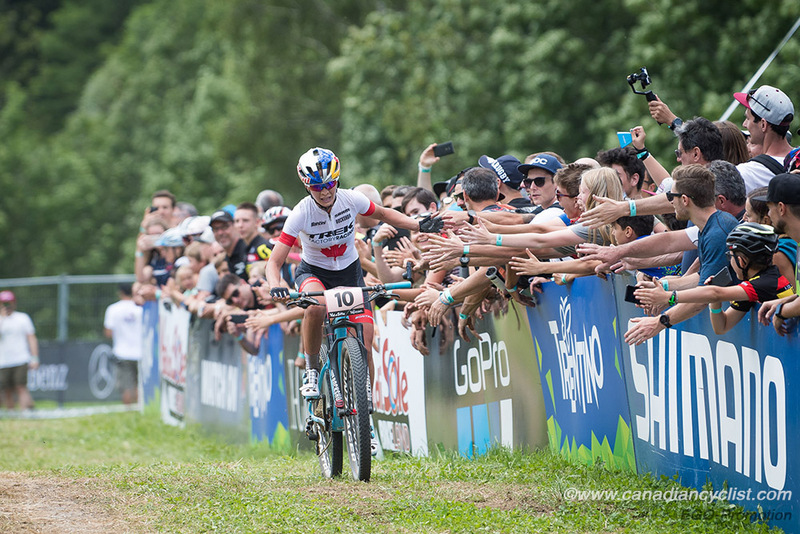 The finish straight here is super short and bumpy, so my goal was to be at the front at the top of the downhill, get a little gap on the downhill and then go all out to the finish." Top Canadian for the day was Leandre Bouchard (KMC-Ekoi-SR Suntour) in 55th, followed by Raphael Gagne (Silverback OMX) in 62nd, Peter Disera (Norco Factory) 78th, Andrew L'Esperance (Canadian National) 90th and Alexandre Vialle 104th. "I did my best today," said Bouchard. "I had an honest start before losing few spots over the race. It's not the kind of result I wanted, but I have no regrets about my effort. 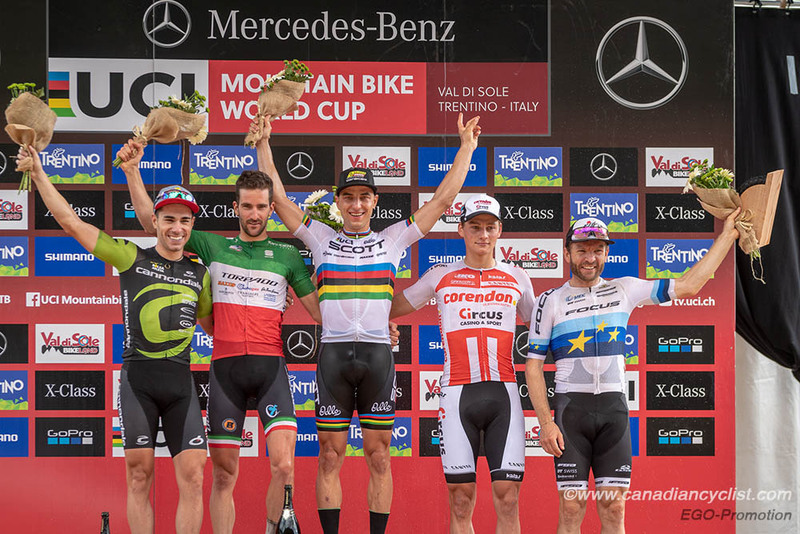 Val di Sole was a beautiful course with really steep climbs and some new features since my last visit." L'Esperance said "After a solid training block, great preparation and awesome support from Cycling Canada and Norco, I came away with a few [domestic] wins with the process. I was aiming for more in the race, but could not move up after a decent start. Fired up for another opportunity in Andorra next week." National coach Dan Proulx: "Our elite men had a tough day but they remain optimistic. Val Di Sole has proven to be a challenge for us over the years. Even at different dates and with slightly different course configurations, it's always been a tough race for the men here. We're talking it over and looking into why that is but for now, we'll quickly turn the page and get ready for Andorra next week." Schurter now leads the overall standings with 1130 points, 310 more than second place van der Poel, who replaces Maxime Marotte (Cannondale Factory), with the French rider slipping to third at 711 points. Disera is the top Canadian in the standings, in 52nd place, a drop of ten spots, followed by Bouchard in 57th, Gagne in 73rd and L'Esperance in 87th.